With the background of the threads like Big Mommas, Your favorite Bull Phenotype, and selecting bulls for carcass, I wondered what factors have the most influence on the sale of bulls in Kentucky. Color, breed, appearance, availability, advertising and marketing, etc. I really have a doubt that Feed Intake Efficiency or that the bull is bred for the environment is a primary factor. Not that it shouldn't be, I am just being pragmatic. Price is a major factor for some folks. Keep in mind, the average herd size in Kentucky is small and cattle are not a major source of income to most producers. Many small producers simply search for the cheapest bull. I have 2 friends that buy bulls in the $1500 to $1800 range. As a result, there are bull seedstock sellers who "claim" their bulls "can be" registered and claim their bulls meet the State CAIP criteria. These bulls have poor phenotype and questionable pedigree assuming you could even document the pedigree. These breeders are fundamentally commerical producers who hold back some bull calves to sell as seedstock. Genetics and CAIP go hand in hand as a factor. If a producer participates in CAIP, they have to declare that genetic improvement is their goal to qualify for the cost share. Bulls sold under this program are registered because approval uses EPDs to document that the bull meets the CE and BW criteria. Advertising and marketing is a big factor. Preparing a good listing with good information and good pictures goes a long way in facilitating a bull sale. Markets like the Farm Fest in Springfield Missouri is a major factor for selling bulls that are gentle, show well and are halter broke. Instead of an auction, buyers get to take a couple days to walk around a public barn where the bulls are tied and see a lot of bulls up close. I much favor that venue over a sale/auction. Appearance has been a major factor in my bull sales. In the Simmental Breed those nice Blaze faces sell. Be interesting to hear what others in Kentucky think and how others in other states compare to Kentucky. Really depends per the customer. In Kentucky for the majority Price, Appearance or phenotype, disposition. Many don't know squat about epd's or pedigree but some do. Had one guy buy 2 at once with the bull program but most don't mess with it here. Have sold probably as many out of state as here in KY. Have also sold bulls to Illinois, Indiana, Missouri, Tennessee, and Kansas. Figure that's pretty well for no bigger number than I raise. Will reputation play into the sale? A poor reputation can put you out of business really quick if you are selling in a small area. A good name should help on some sales. Yeah I'll say reputation can play a large factor. Especially for those whom sells many bulls. You want your customer to talk good about your bull and like him word will get around. I’m my area of Ky price plays a pretty big part in bull sales. Getting over $1500-1800 will be pretty tough no matter how good the bull is. I can't imagine being that much of a dumb a$$. Is the CAIP money available for bull purchases made outside of Kentucky? It seems like there's a good market for someone that has proven bulls for carcass quality, ADG and the numbers to back them up. 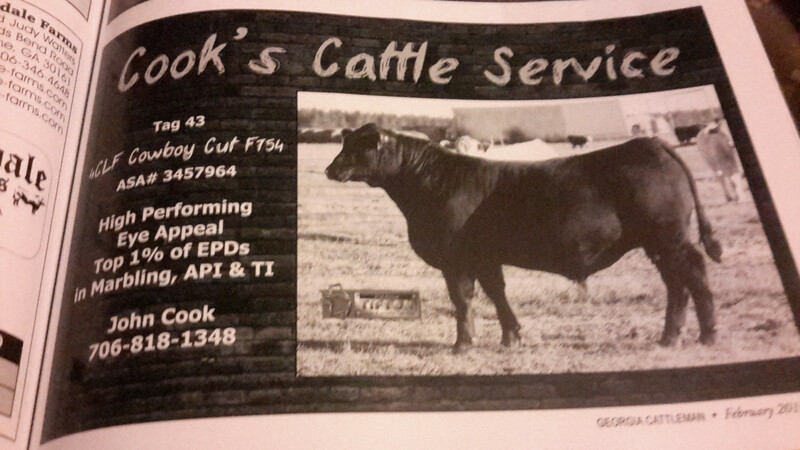 As long as the purchase meets the CAIP criteria, the bull/heifer can be purchased from outside the state of Kentucky. We have this bull for sale at the UGA, Tifton bull evaluation sale on Wednesday, March 6th. There's a lot of interest in this bull from all over the country. I like my Cowboy Cut calves. I am excited to see how they grow out. I would say price is the main factor in bull sales, for the most part getting the most bull for the least money. Size plays a major role. When I was in the registered business 20 to 30 yrs ago, size was next in line next to price. EPD's were very new at that time especially with Charolais, so they really did not factor in at that time much at all. Fast forward to today, I think price is still the main issue. I think the cost share programs have promoted the idea of EPD's with birthweight being a priority in a lot of situations. Weaning weights are probably next in line, I doubt many look at other EPD's very closely. I have a question for you simi guys. What is the appeal of the blaze face? I know buyers seem to want a blaze, but my question is why? Is it just a visual preference thing? Does it add value to the calves? Anytype of added preformance? Don’t think I’m bashing you guys, just never understood the simi blaze. Around here the angus Hereford cross is very popular. I do it a lot because I can sell the females easily private treaty. The steers don’t seem to sell any better or worse than comparable solid black calves. Generally mine all sale in the same lot. Blacks, bwf, and the handful of reds I get. 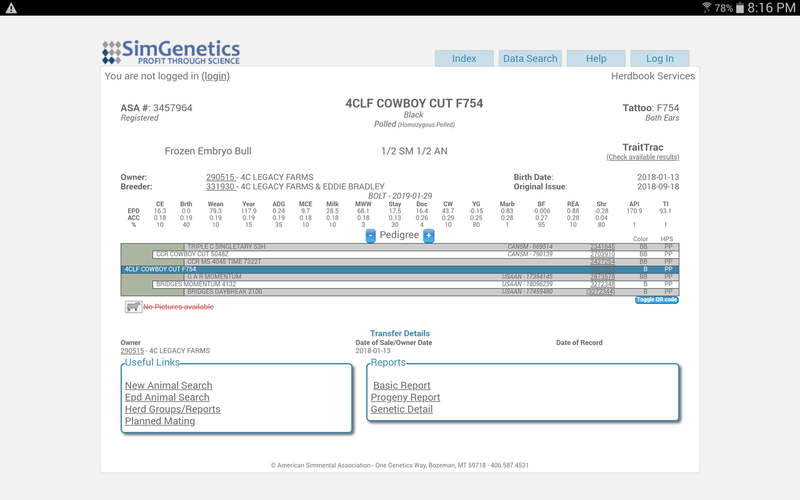 The general thinking of the bwf is the buyers can see that the calf is crossbred for the heterosis. It does not influence performance. It does increase interest based on eye appeal. There are a couple producers who have made it a trademark. You drive by their pasture and you see these nice Simmental cows all black with a pretty white Blaze. It is becoming a fad if not already one.